I have so much vegan amazingness to bring you today! 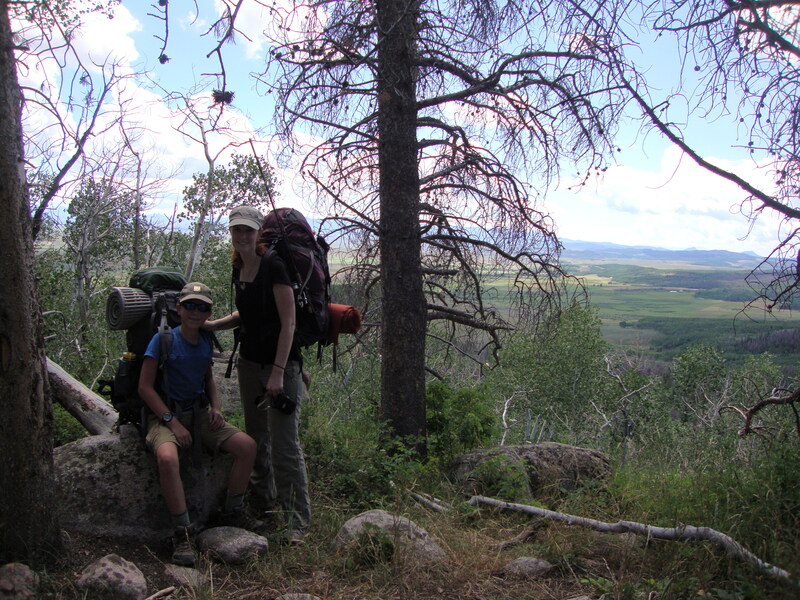 We just returned from a 3-day backpacking trip and I have lots to share, so hang in there with me, ok? 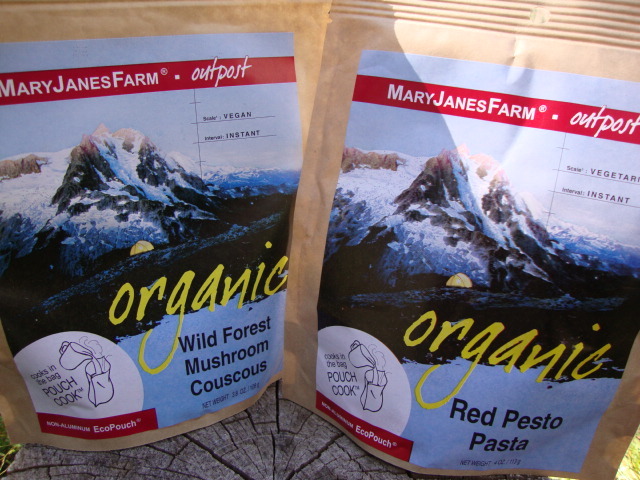 We also picked up organic, vegan freeze-dried meals from MaryJane’s Farm Outpost, so I’m including pictures and reviews of their products as well. 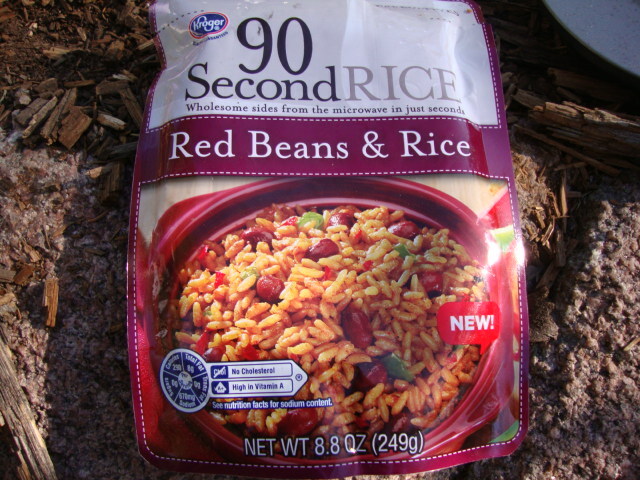 The Husband also tried a new Backpacker’s Pantry vegan variety as well . 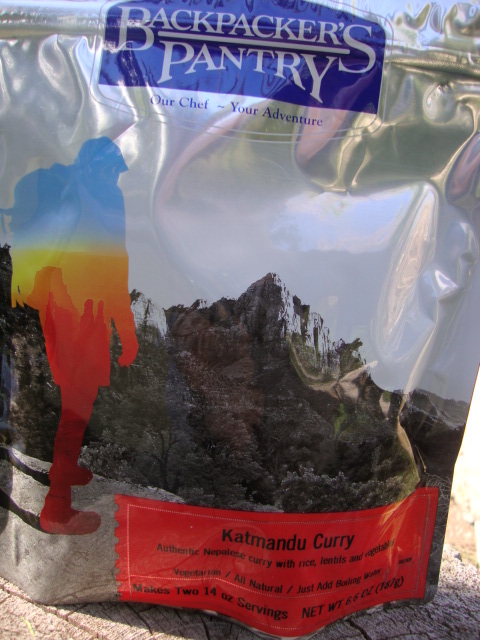 . . the Katmandu Curry. 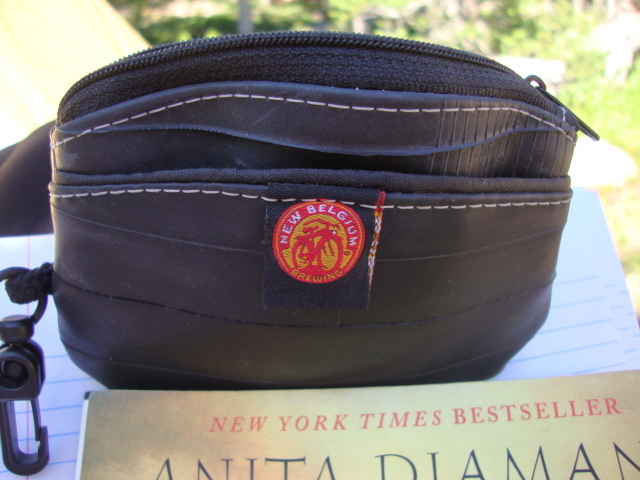 When we go hiking for the day, when all I have to lug is a bottle of water, I’m off. The Husband complains that I leave him and the Seventh Grader in the dust, but I can’t help it. Once I get going, I let the momentum carry me. 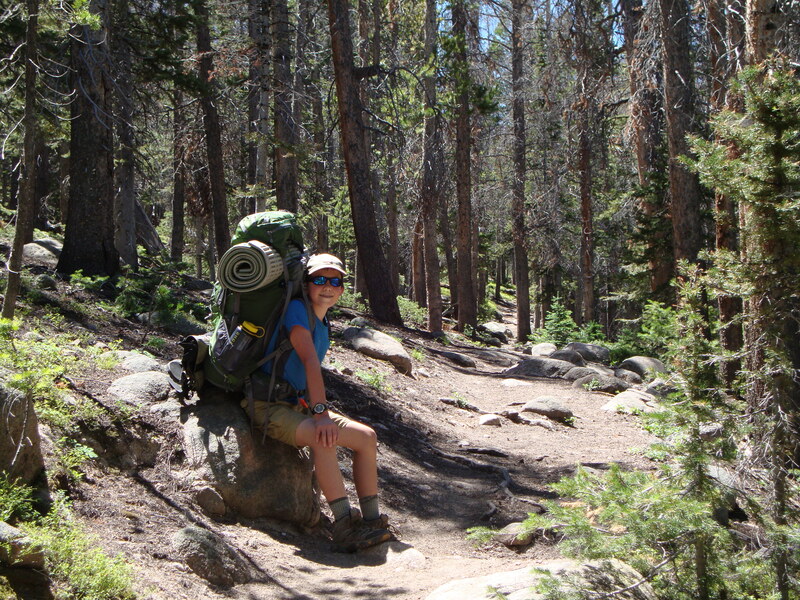 The sure-fire way to slow me down is strap a 35-40 lbs pack on me . . . and give me a camera. I took almost 200 pictures. (Don’t worry, I won’t post them all here). 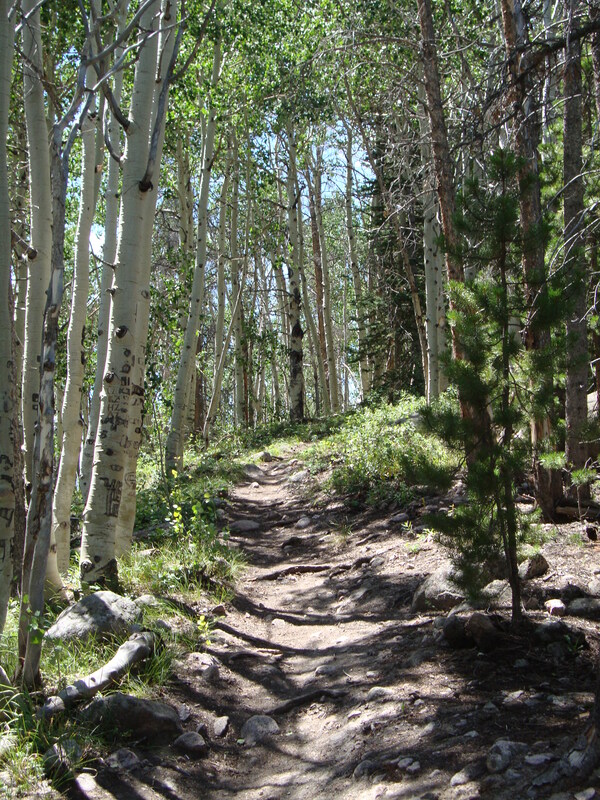 But I do have to show you one of my favorite parts of the trail. 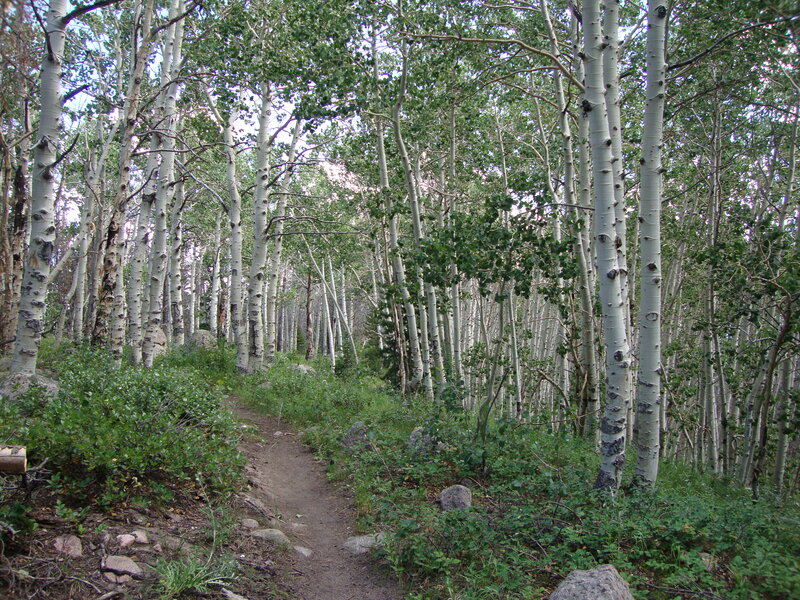 A mile into the 4 mile hike, the trail meanders through a forest of aspen trees; it’s absolutely gorgeous. My dad first brought me to this area in 2003. 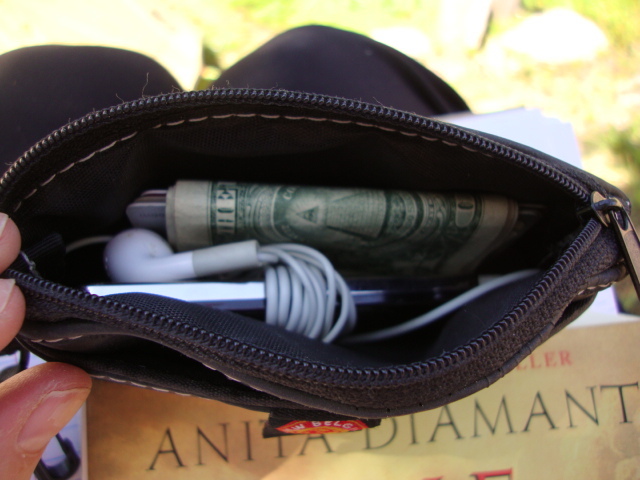 This was his favorite place to backpack, so it has a lot of special meaning to me. He passed away nearly five years ago, but we continue his legacy by returning here once or twice a year. The Seventh Grader got to experience it for the first time. We arrived at camp around two in the afternoon and got things set up. 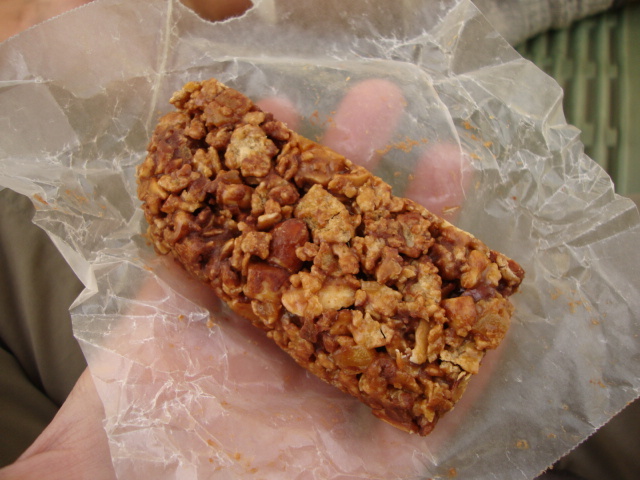 As we took shelter from a brief rainstorm, we thoroughly enjoyed the (no bake) Roasted Nut and Mango Energy Bars I made the day before. These were delicious and so easy to make. The recipe makes 10 bars, but I don’t recommend packing all of them–at least not one person packing them in, as they are kind of heavy. Individually, they’re fine. Make sure you have all your ingredients chopped and ready to go before starting. In a small skillet, dry toast the almonds and peanuts until fragrant and browned. Let them cool. In a medium to large saucepan, heat the agave and brown sugar and let simmer for 1 minute–just don’t boil it. Remove from the heat and add the peanut butter; stir with a whisk until smooth. 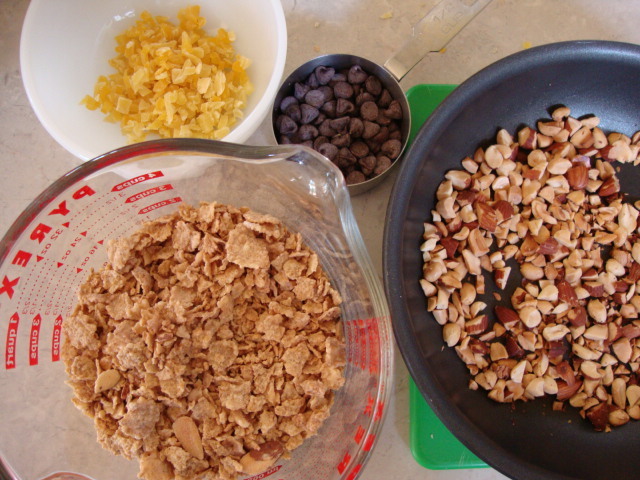 Add the crushed cereal, nuts, mango and chocolate chips; combine well. Coat the bottom and sides of an 8″ baking dish with vegetable oil. 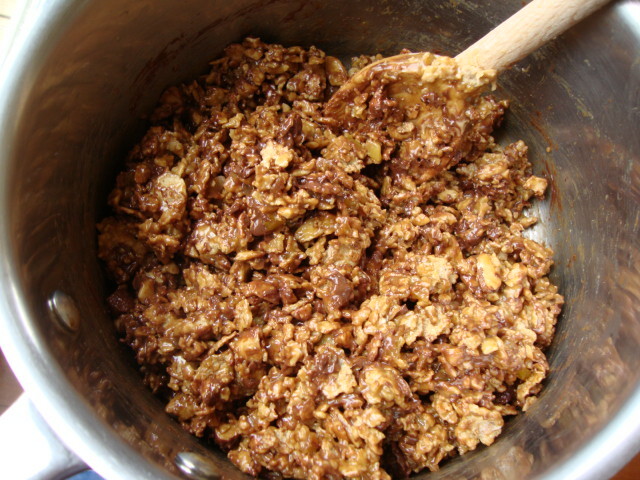 Scoop the mixture into the pan and press down so that it is even. 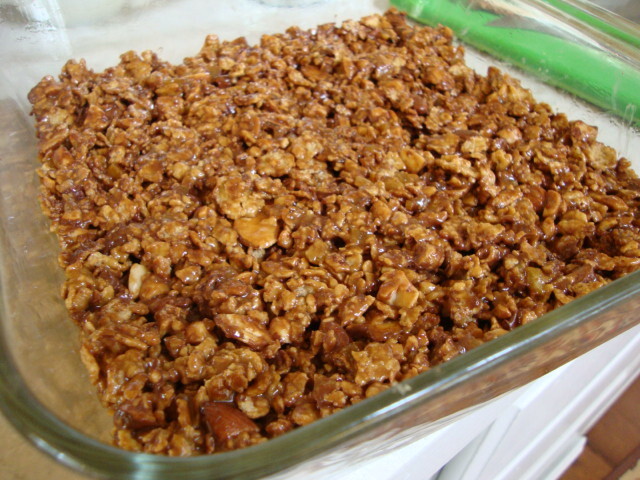 Place in the freezer for 30 minutes. The recipe then says to transfer the pan contents to a cutting board. Well good luck getting those contents out of the pan right away. I had to let it thaw on the counter for about 20-30 minutes, before loosening the edges with a knife and using a metal spatula on one side to get it out. No big deal, just don’t expect the bars to pop right out. Yes, that’s snow. 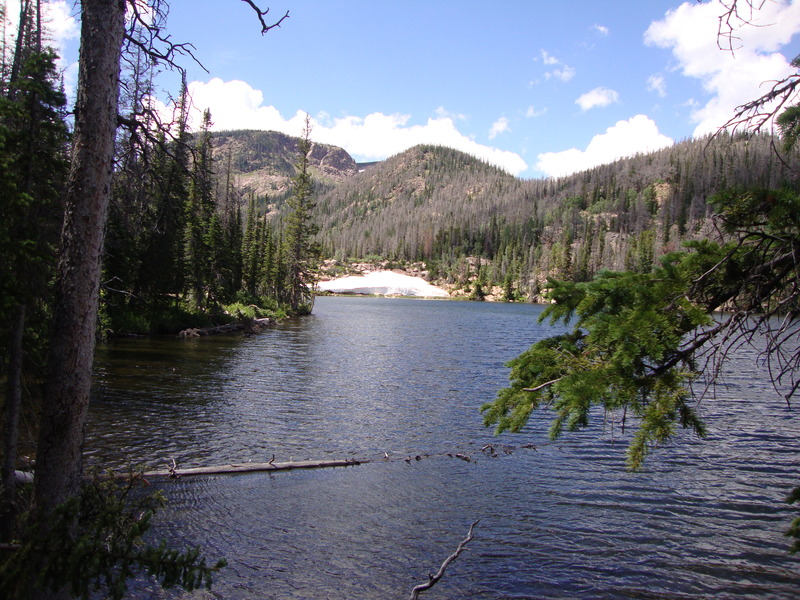 This lake is about 8500 feet in elevation, so there are lots of places where there is snow year round. And you may be wondering why the trees are gray. That’s not a usual Colorado thing. Unfortunately, that’s the result of the pine beetle. 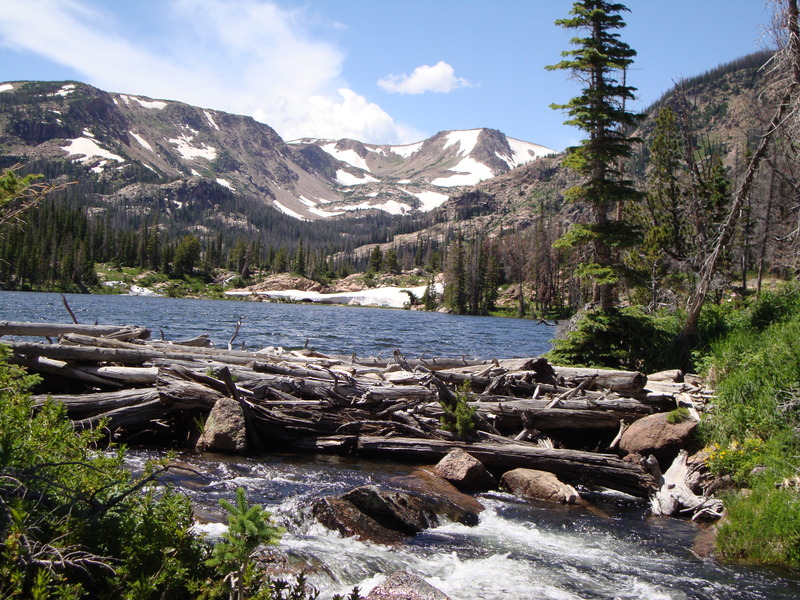 They’re killing lodgepole pines throughout the United States and Canada. It’s incredibly sad to see. That’s Mount Ethel. 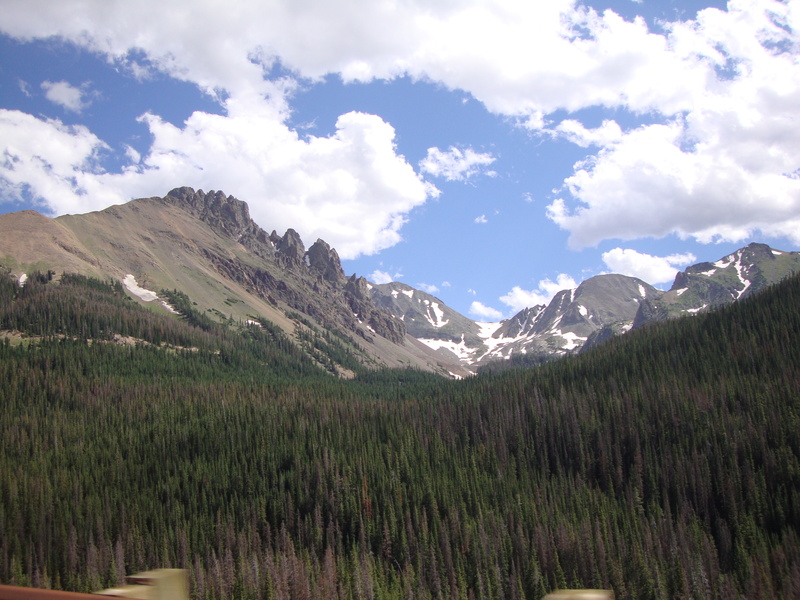 Ain’t she a beaut at nearly 12,000 feet? For the first night, I chose the Ginger Sesame Pasta ($8) The Husband had had this one before on a earlier trip, so he recommended it. 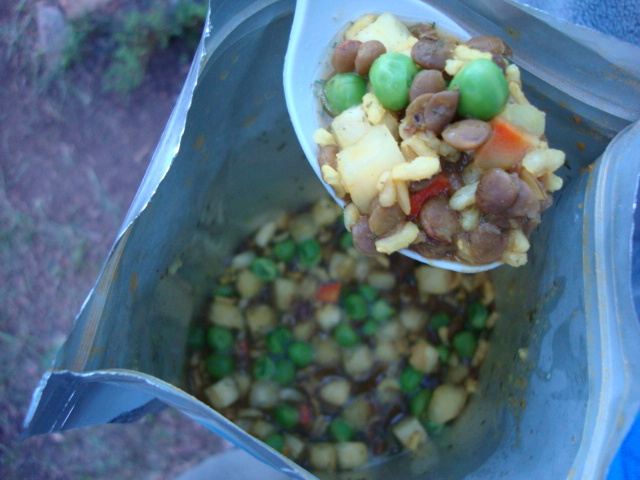 Unlike most freeze-dried meals, this one serves one, not two. So, tear off the top of the package . . .
. . . and pour in 1 cup of boiling water. Stir it really, really well. 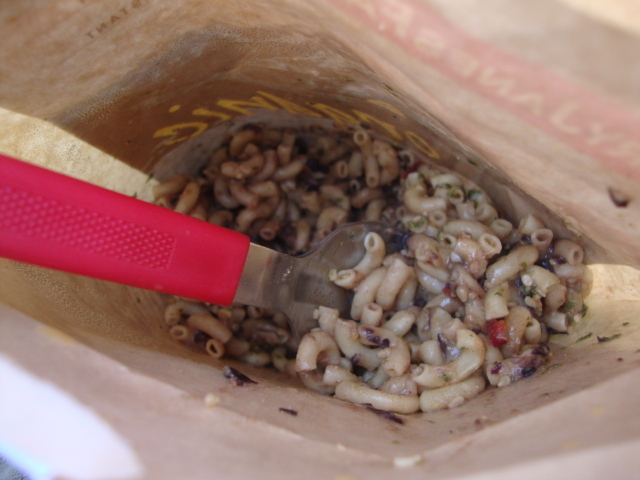 I noticed I didn’t do a very good job because later, there was some unmixed seasonings on the bottom of the bag. Fold down the top and let sit for 8-10 minutes. It really tasted great. I’m not a huge fan of black beans, but I didn’t mind them at all in this. It was also just the right amount of food for one person. 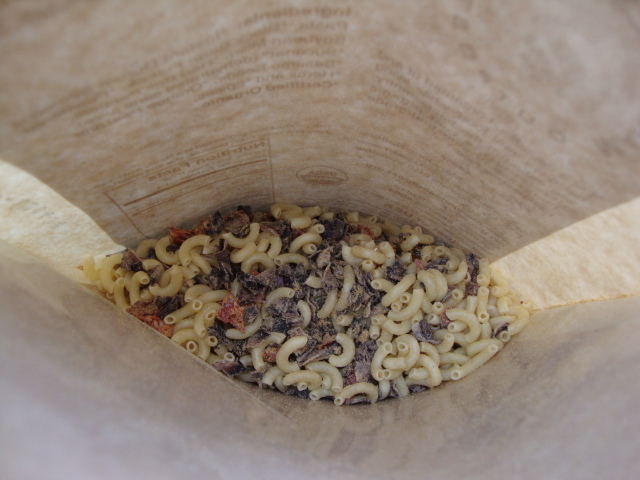 You’d never know this meal was freeze-dried. After a long day of hiking, this was ideal. 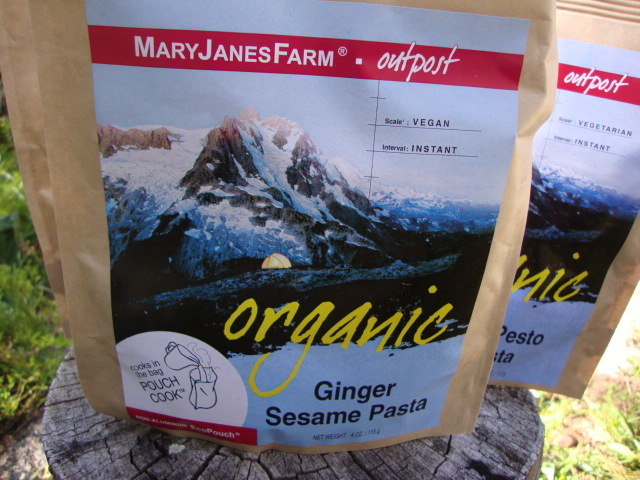 Ingredients: Organic Instant Durum Semolina Pasta, Organic Black Bean Flakes, Organic Powdered Soybean Miso, Organic Red Bell Peppers, Organic Sucanat® (dehydrated cane juice), Organic Sesame Seeds, Organic Orange Peel and Organic Herbs & Spices. For the second night, I had the Wild Forest Mushroom Couscous ($8.75) This was even more delicious than the sesame pasta. LOVED it!! Add 1-1/2 cups of boiling water, stir really well, then seal it up. Let sit for 5 minutes, then stir again. Ingredients: Organic Couscous, Organic Powdered Soybean Miso, Organic Pine Nuts, Organic Oyster Mushrooms, Shiitake Mushrooms, Organic Garlic and Lovage. For the first night, the hegans went vegetarian with Mountain House Pasta Primavera ($6.50). Each pouch serves two, but they’re guys and they eat a lot; no need to split one. 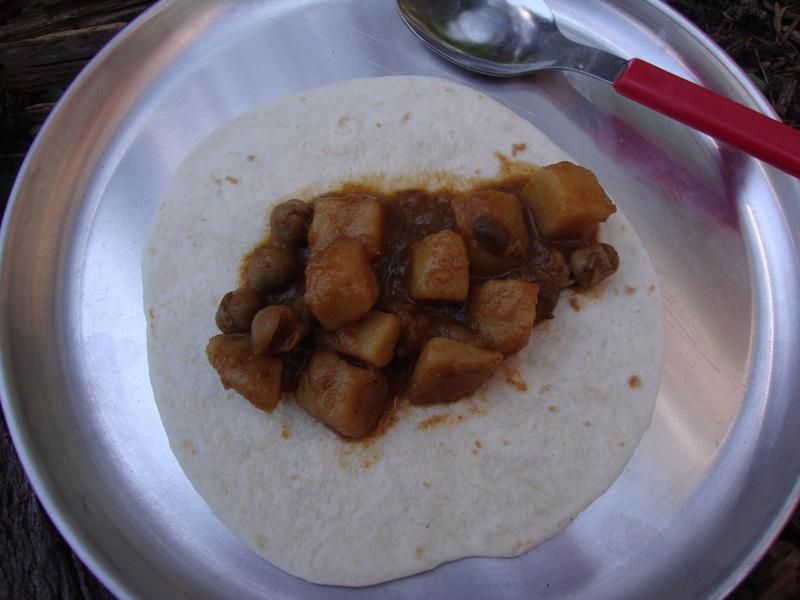 The second night, The Husband went with Backpacker’s Pantry Katmandu Curry ($6). This one definitely serves two–he couldn’t finish it all. Plus, it had a bit of kick, so beware if you’re not into spicy food. It also took longer than most–about 20 minutes. It also requires 2-3/4 cups of boiling water. He thought it was very good, but we’ll just have to keep in mind that it easily serves two people. Ingredients: lentils, precooked parboiled long grain brown rice, potatoes, carrots, peas, sauce (salt, garlic, turmeric, coriander seed, cumin seed, ginger, nutmeg, pepper, cayenne pepper, parsley, bay leaves, cinnamon, cloves, dill weed, fennel seed). 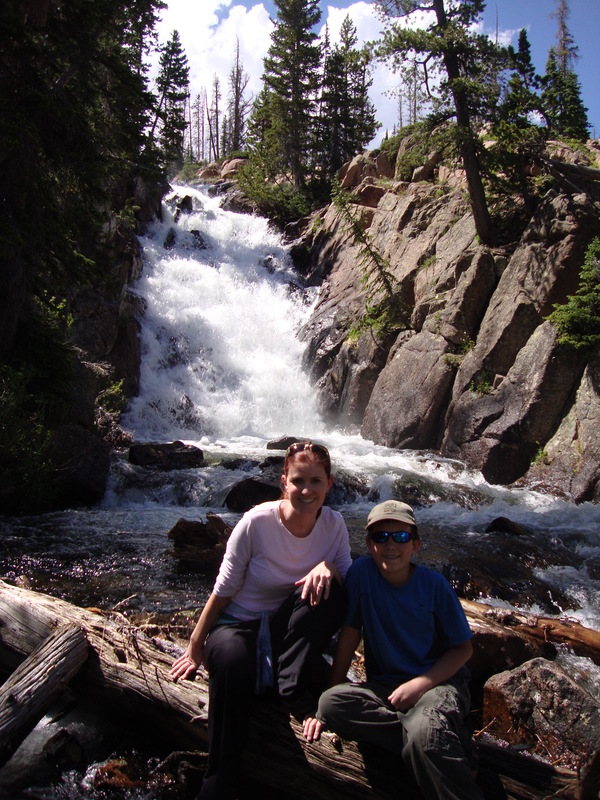 During some hikes the second day, we discovered this amazing waterfall and another small lake at the base of it. It was so incredible! 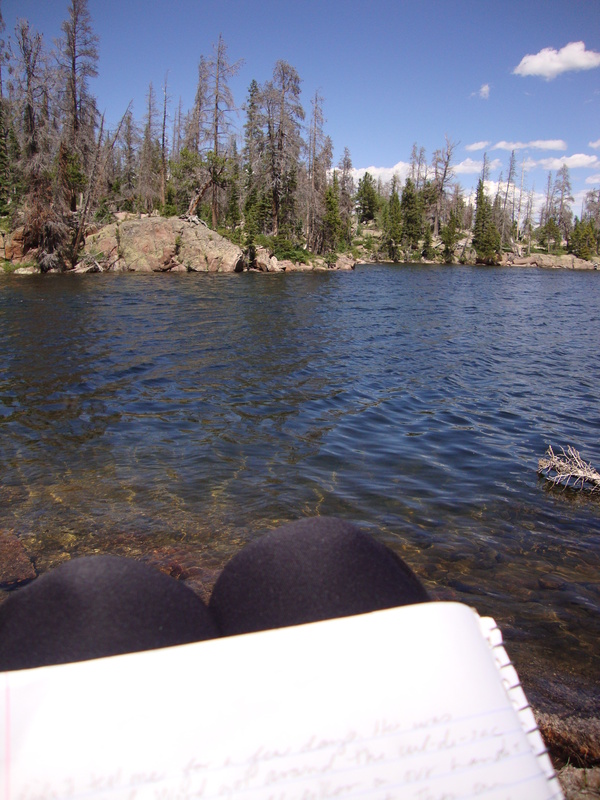 The day was gorgeous and I spent much of it exploring and carrying around my portable, fold-up seat, a notebook, pencil and a book. 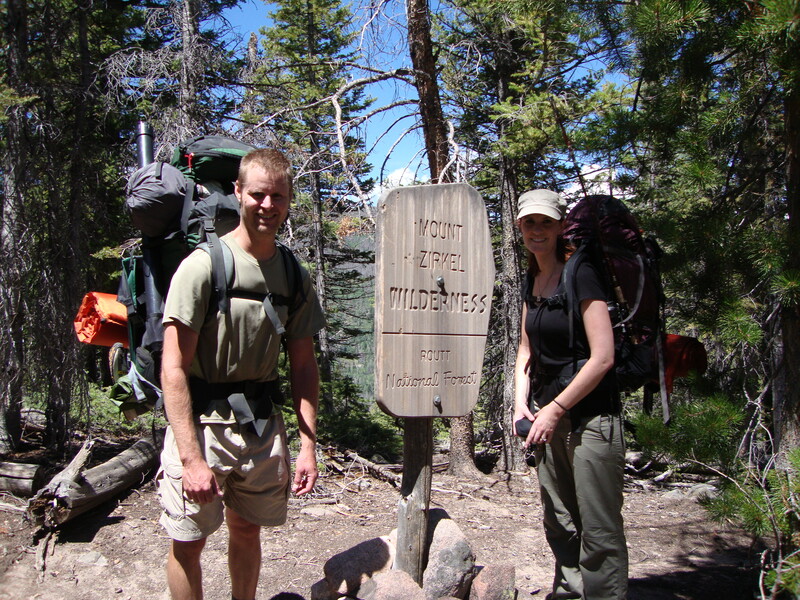 The book that I wanted to bring, The Ledge, is a hardback–not a good choice for backpacking–but an excellent read! One of the authors, Jim Davidson, is a fellow NCW member and his story is amazing. 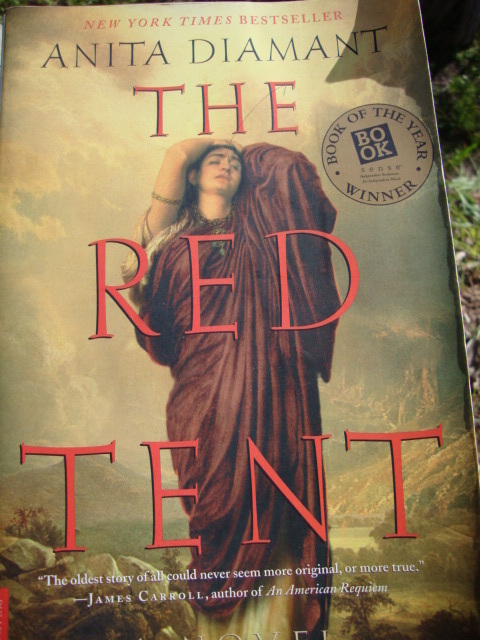 I settled for The Red Tent. 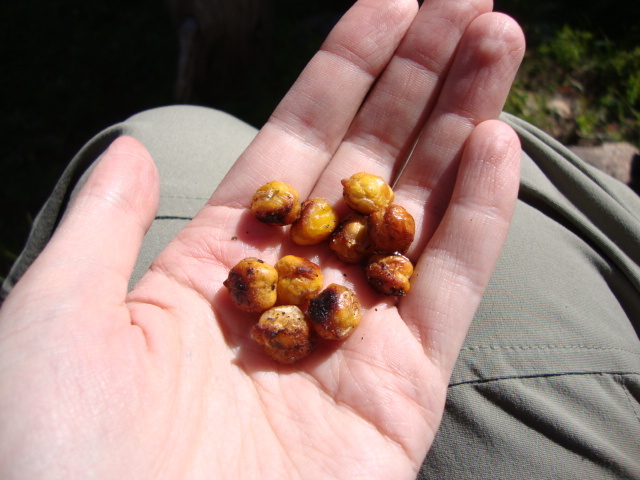 For a snack, I made some Lime and Black Pepper Roasted Chickpeas the day before we left. These were great to snack on and had lots of flavor. 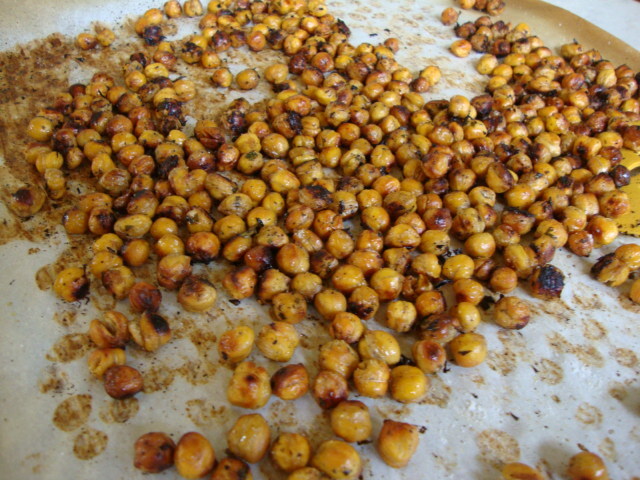 I had always wanted to roast chickpeas, but never found the time. I also doubled the recipe. Preheat the oven to 425. Line a large baking sheet with parchment paper. In a large bowl, combine the olive oil, pepper, lime juice, and cilantro. 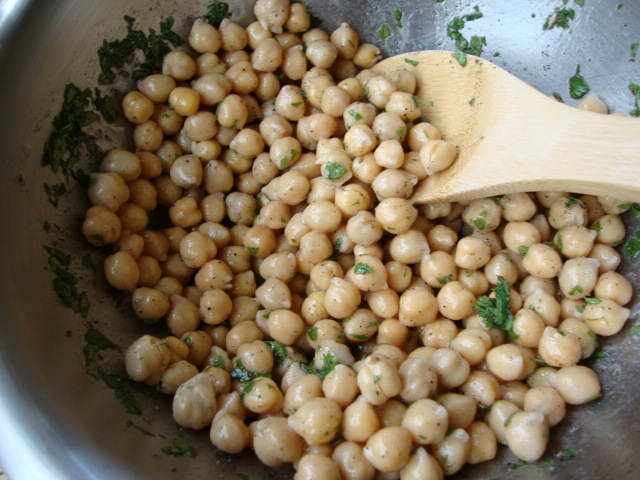 The recipe says to line the pan with the chickpeas (removing any loose skins from them) and pour the sauce over them. I opted instead to pour the chickpeas into the bowl with the sauce and combine them that way. I then poured them onto the pan. Bake for 35-50 minutes, stirring every 10 minutes. They should come out crispy and dried through. Sprinkle with the salt. These were light enough to pack and offer some much-needed carbs after all of the hiking. 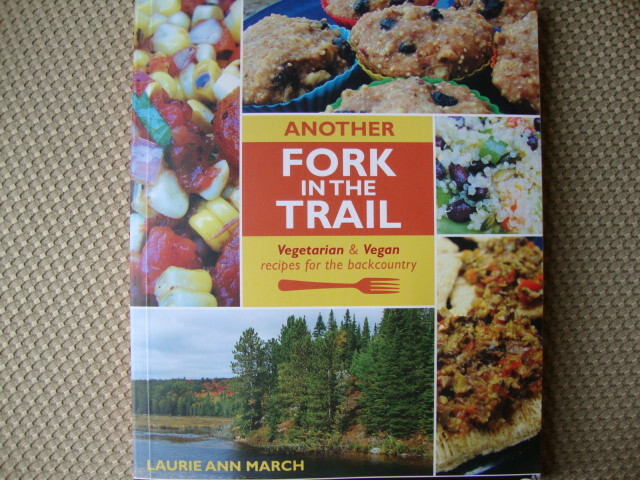 When I saw this recipe in Another Fork in the Trail, I knew I needed to make it for this trip. It calls for hazelnuts, but the store (a major grocery chain) apparently only carries them during the holidays and I didn’t have time to hit another store, so I went with pecans. No problem. 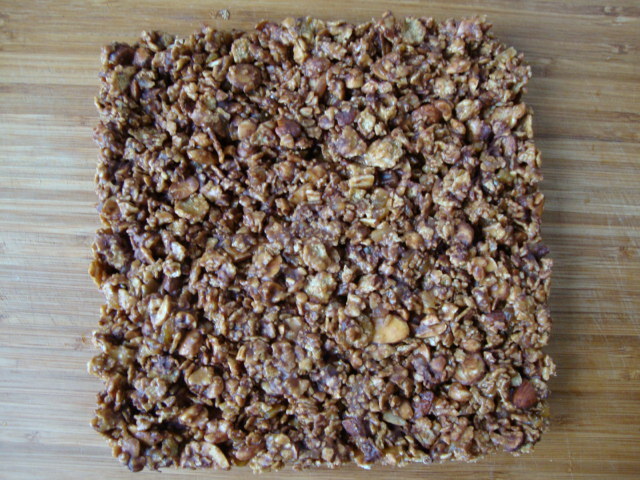 This easy to make, light-weight cereal was one of my favorites meals. Loaded with protein, it kept me going all morning. 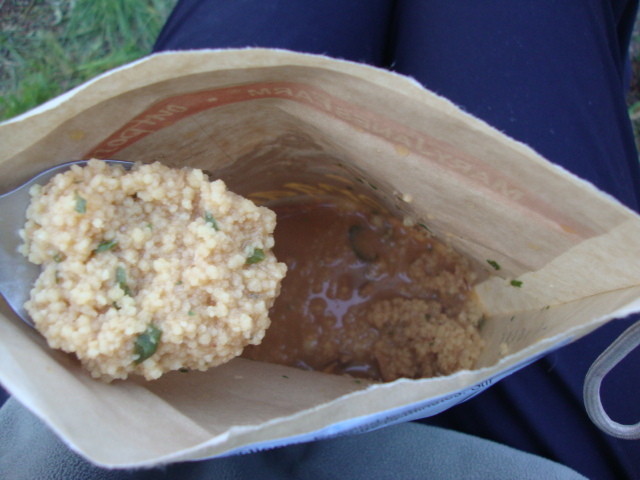 At home, rinse the quinoa under cold water for at least 3 minutes. Drain and toast in a dry nonstick skillet until the quinoa begins to pop. Let it cool and place it in a large ziplock bag. 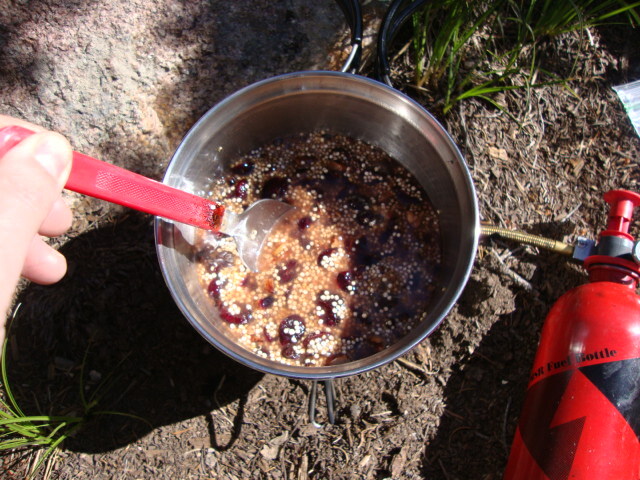 Add the salt, sugar, cinnamon, and blueberries. Toast the pecans until browned and fragrant. 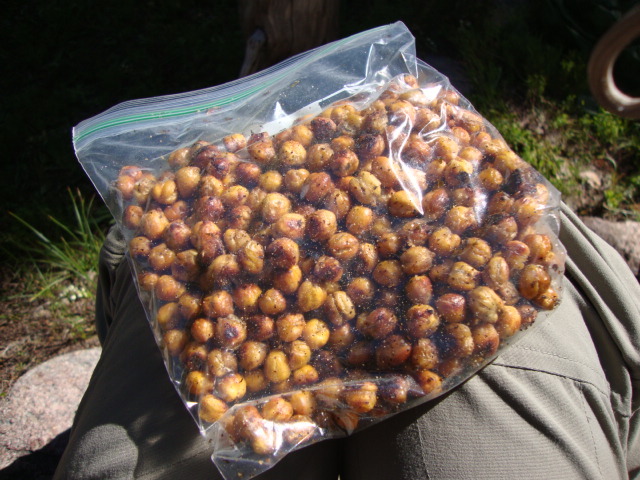 Place the cooled nuts and brown sugar in a snack-sized ziplock bag. 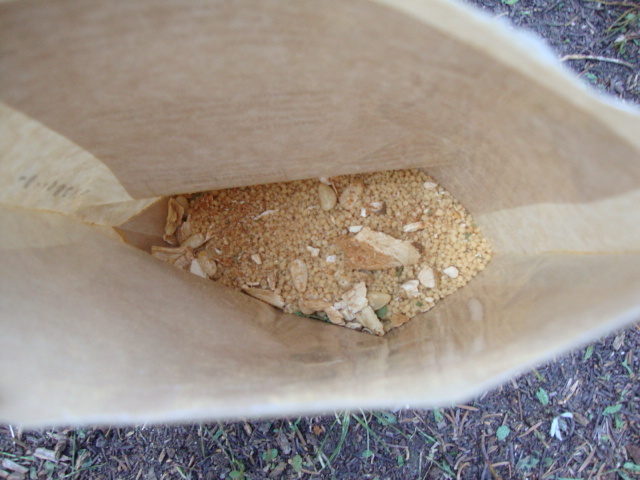 Place it into the larger bag and in another small bag, add the powdered soy milk. 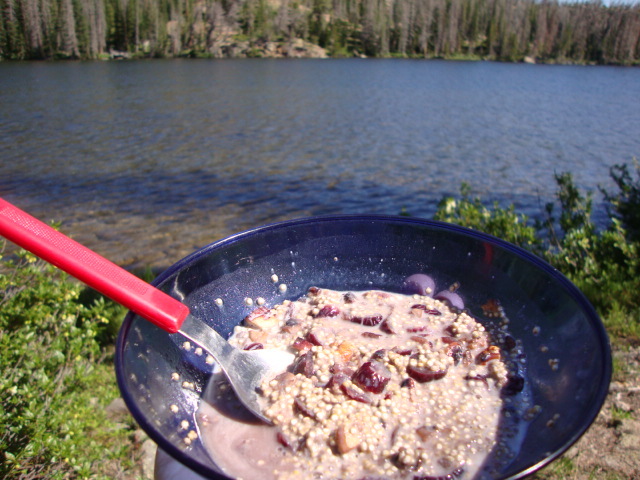 At camp, I placed about a 1-1/2 cups of the quinoa mixture in the pot with about 1/2 to 3/4 cup of water. Let it simmer for about 10 minutes, stirring often. Bombay Potatoes from Tasty Bite. One bag made 4 small servings. Just pour into a pan and heat. Tasty, indeed! 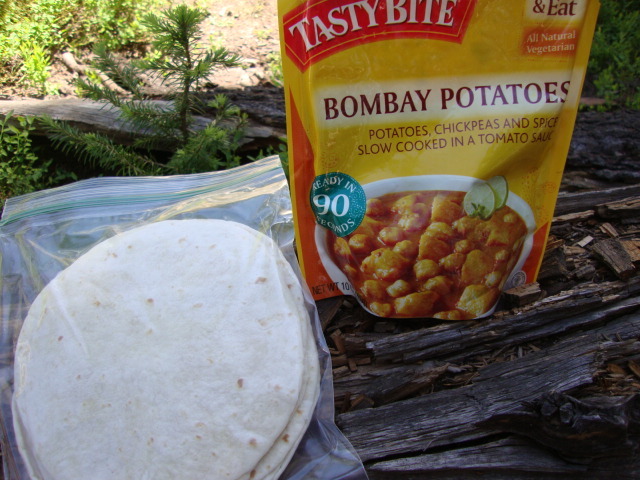 If you’re going for ultra light backpacking, these are a bit on the heavy side, but for a quick lunch at home or camping, they’re ideal. 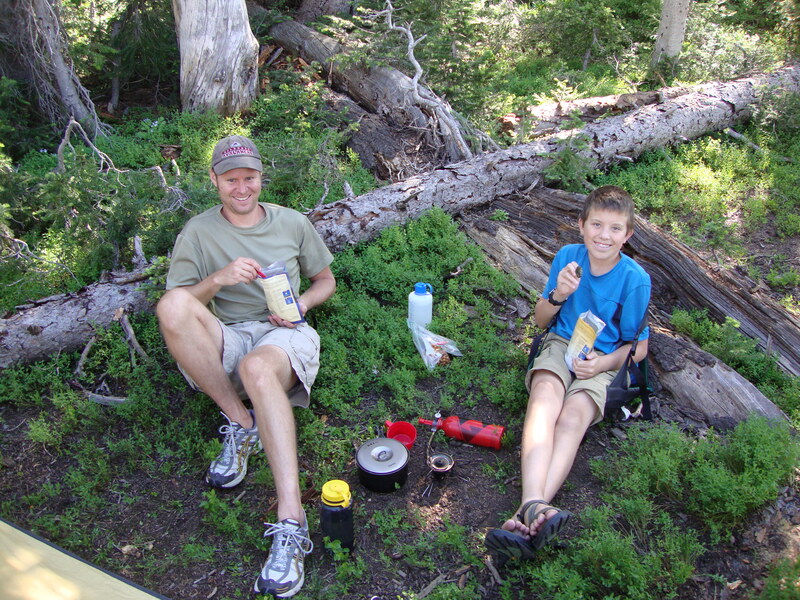 Again, this heat and serve product is great for camping and backpacking. 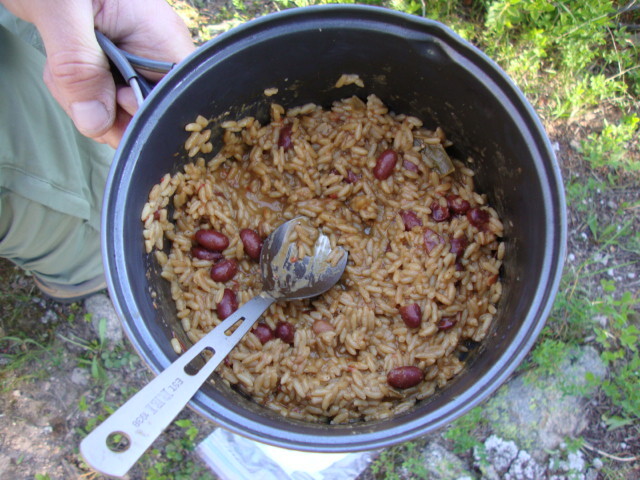 Eat with a tortilla or by itself—a great protein and carb option while backpacking. One day, we even went with good old Ramen. Because the spice packets aren’t vegan, we just used the noodles and seasoned them with salt and pepper. 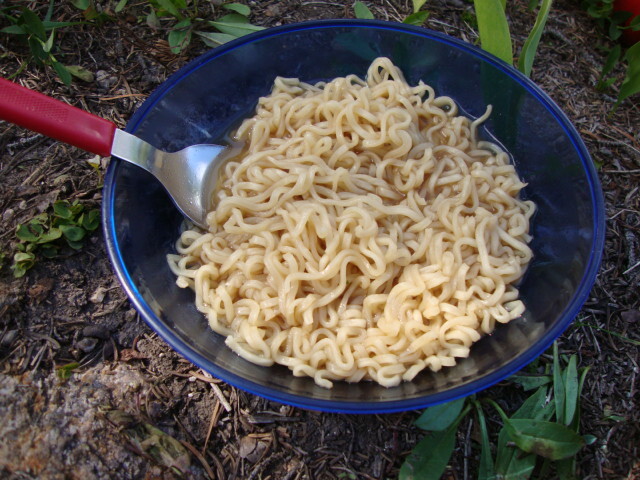 You may be sick of Ramen from your college days, but they’re incredibly lightweight and cheap, making them ideal for backpacking. 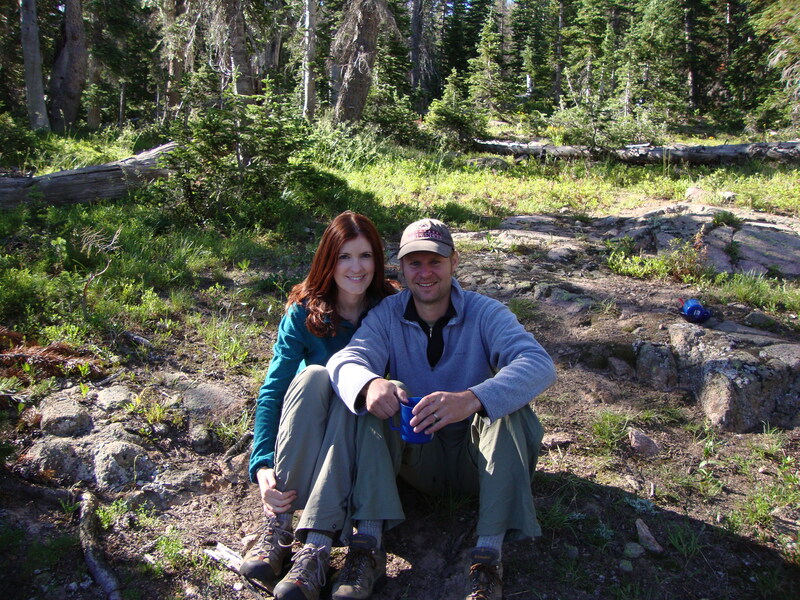 Besides, everything tastes good when you’re camping. 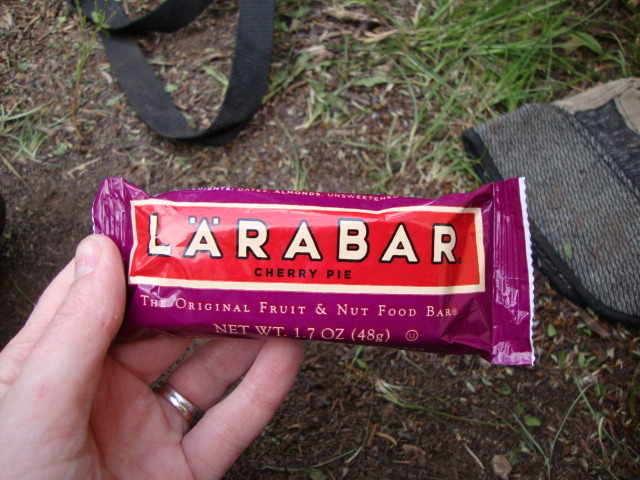 When we go camping/backpacking we always stock up on Larabars. 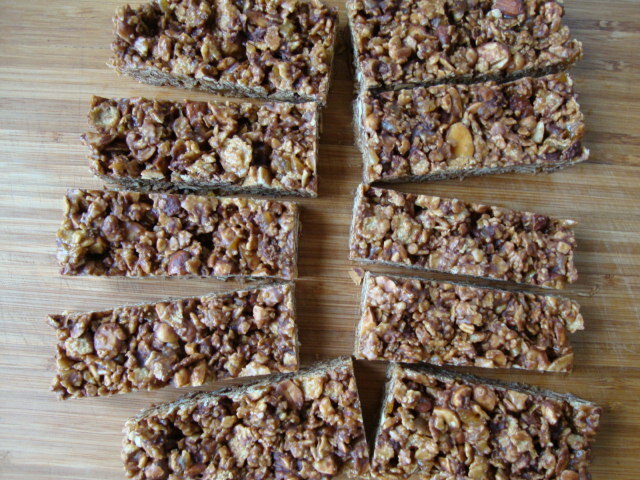 They’re vegan, gluten-free and have 3-9 ingredients. Wow . . . am I finally done? Thanks for sticking with me on this journey—I know it was a lot!